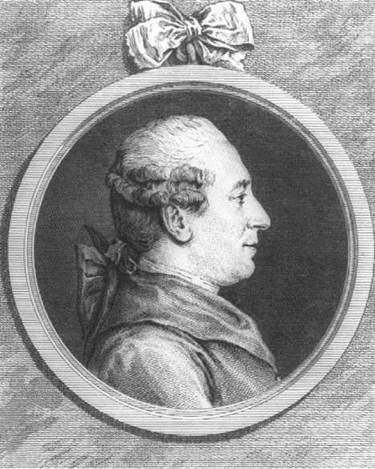 Pierre August Beaumarchais. Beaumarchais, Pierre August, photograph. The Library of Congress. Pierre-Augustin Caron de Beaumarchais is considered one of the greatest playwrights of eighteenth-century France. Working in a period of stylistic transition, he effectively synthesized elements of Moliere’s comedy of manners, Italian commedia dell’ arte (play of professional artists), and the ideas of Denis Diderot concerning the drame bourgeois (bourgeois tragedy). Although his early plays are rarely performed, The Barber of Seville, and, above all, The Marriage of Figaro are considered masterpieces of the comedic genre and are frequently produced. Life at Court. Beaumarchais was born Pierre-Augustin Caron in Paris on January 24, 1732, the son of a clock- maker. He was educated at the Ecole d’Alfort until the age of thirteen, then apprenticed to his father. During his employment as a designer in his father’s shop, Beaumarchais invented a new type of escapement for regulating watches that was recognized by the Academie des Sciences in 1754. He was presented at court the same year, where he soon won the favor of Louis XV and his mistress Madame de Pompadour. Beaumarchais consolidated his position at Versailles, in 1755, when he bought an annuity from a retiring court official, Franquet. The following year, he married Franquet’s widow, who died in 1757, leaving him a small property from which he derived the name Beaumarchais. An increasingly influential figure at court, Beaumarchais became the music instructor to the daughters of the king, and organized concerts for special occasions. During this period he became friendly with Joseph Paris-Duverney, a powerful banker who invited Beaumarchais into the world of high finance and made him a partner in speculative business schemes. Through Duverney’s assistance, Beaumarchais purchased, in 1761, the title of Secretaire du Roi, which conferred legal status of hereditary nobility. Beaumarchais Begins his Writing Career. Beaumarchais visited Spain from 1764 to 1766, where he attended court and pursued financial negotiations on behalf of Duverney. He returned to Paris, in 1767, to present Eugenie, his first serious effort as a playwright. His next play, The Two Friends, was produced three years later. Beaumarchais was involved in a series of highly controversial court cases in the 1770s, and consequently his influence at Versailles in the final years of Louis XV greatly diminished. With the accession of Louis XVI in 1774, however, his fortunes rapidly improved; he even served as a government agent in 1774-75, providing aid to American forces during the early phases of the Revolutionary War. Also in 1775, he produced The Barber of Seville, and in 1784 his masterpiece, The Marriage of Figaro, which enjoyed an extraordinary success at the Theatre de la Comedie Francaise. Beaumarchais’s interest in opera became manifest when he wrote the libretto for Tarare, set to music by Salieri and produced in 1787. French Revolution. Although Beaumarchais initially welcomed the meeting of the Estates-General in Paris in 1789, the increasingly radical course of the French Revolution made his position extremely precarious, and he was arrested in 1792, narrowly escaping the September massacres—an explosion of mob violence, which resulted in the killing of half the Paris prisoner population. Beaumarchais subsequently fled to England and Holland before settling in Germany as an emigre; meanwhile his family was imprisoned and his properties alienated to the Jacobin regime. Beaumarchais returned to France in 1796, but his appeals for the restoration of his property were unheeded, and he was left destitute. He died of a stroke in Paris on May 18,1799. Laurence Sterne (1713-1768): Experimental English novelist who is best known for his novels including The Life and Opinions of Tristram Shandy, Gentlemen. Voltaire (1694-1778): French philosopher and author who, although a very popular figure, was exiled from Paris for most of his career. Benjamin Franklin (1706-1790): American Founding Father whose many activities include writing, invention, and diplomacy. Joseph Haydn (1732-1809): Austrian composer who is one of the most important early figures in the history of symphonies. Henry Cavendish (1731-1810): English scientist who discovered hydrogen. Benedict Arnold (1741-1801): Born in Connecticut, this general fought first for the Revolutionaries in the American Revolution but later switched sides and supported the British Army in its attempt to halt the revolution. Beaumarchais’s plays, influenced by Moliere, incorporate complex characters and critiques of social customs and the relationship between the aristocracy and the other classes of society. While it is debatable just how revolutionary this tactic was, it is clear that Beaumarchais was very successful in his criticism of the aristocracy, given that, in response to one of his plays, the King of France suggested that it could singlehandedly bring down his monarchy. Pleas for Social Justice. Beaumarchais saw his second play, The Marriage of Figaro, premiere in 1784; it excelled both as satire and as a plea for social justice. Figaro the barber, now risen to the rank of gatekeeper at the chateau of Count Almaviva, wishes to marry Suzanne, the countess’s maid. Although the count agrees to this marriage, he also wishes the young woman’s favors for himself, adhering to the long-standing droit de seigneur. Consumed by jealousy and infuriated by the escapades of the page Cherubin toward his wife, the count avenges himself in aiding the countess’s servant, Marceline, in a lawsuit against Figaro. Through its many romantic intrigues, which link characters of diverse classes, The Marriage of Figaro can be considered a plea for social justice. In both The Barber of Seville and The Marriage of Figaro Beaumarchais’s role as defender of morality of both sexes is offered through the representation of diverse views on love, money, and vanity, of concern to all classes in his society. Originally banned by Louis XVI, who stated that its performance would require the destruction of the Bastille, The Marriage of Figaro was first performed in private before the count of Artois, the King’s brother. In 1784, the ban was lifted; first performances were both successful and scandalous, with Beaumarchais himself inciting groups of moralists and conservatives. In addition to his considerable efforts at using complex characters to take jabs at the aristocracy, Beaumarchais was inadvertently responsible for ushering in a new era of opera when his The Marriage of Figaro was put to the music of Mozart. In this modern era of opera, the focus moved from music to action, a shift that writers had been petitioning for, for quite a while before Beaumarchais. Influence on Modern Opera. Beaumarchais realized his ultimate ambition: he reform opera, and the reform was revolutionary and permanent. It was by setting Beaumarchais’s The Marriage of Figaro that Mozart achieved his operatic ideals and gave himself at last the central dramatic ensemble that had to be constructed for him factitiously in The Abduction from the Seraglio. The experience also radically altered Mozart’s style, and determined the course of opera for the next century. Part of the credit must be given to Lorenzo Da Ponte, who adapted the play for Mozart, but even more belongs to Beaumarchais himself. His theater was not transformed into opera, but was originally conceived in operatic terms, quite literally inspired by the tradition of comic opera and its unrealized possibilities. As spokesperson for the Enlightenment, Beaumarchais had considerable influence on eighteenth-century social institutions. Through dramatic, lyric, and autobiographical texts, he synthesized the spirit and fulfillment of his age into forms that relegated laughter to the service of characters. His drama was strikingly original in its portrayals of multifaceted characters and the social problems of the revolutionary period. Thus, he humanized stereotypes, according them the variety of social backdrops he himself had known. Relying on art, he displayed his public to itself, proclaiming through his wit essential preconditions for an aristocracy of merit and the advent of a new age. Ulysses (1922), a novel by James Joyce. Before this text was published in a single volume, its various parts were published in a magazine over a period of almost two years. During this time, Joyce was charged with indecency for his portrayal, among other things, of masturbation. Harry Potter and the Sorcerer's Stone (1997), a novel by J. K. Rowling. Although never officially banned by the government, the entire Harry Potter series has been challenged by various groups for its purported promotion of magic and devaluation of Christian beliefs. The Satanic Verses (1988), a novel by Salman Rushdie. An analysis of Muslim identity in the modern world, this work was so controversial and considered so blasphemous by Muslim leaders that the Ayatollah Ruhollah Khomeini, the Supreme Leader of Iran, issued a decree that any good Muslim ought to kill Salman Rushdie and his publishers for the heresy the book contains. Contemporary Approaches to Beaumarchais Beaumarchais’s critical stature is considerably higher in France than in the English speaking world, where his work has received comparably scant attention. Critics from England and America have explored diverse themes in their analyses of Beaumarchais’s plays. Whereas some commentators consider them merely an extension of particular historical movements—for example the French Enlightenment— others consider the plays in terms of character types, dramatic structures, or thematic motifs, such as that of children’s games explored by Walter Rex. Critics are in general agreement, however, that Beaumarchais transformed classical French comedy by emphasizing its social discourse as opposed to its formal stylistic properties. 1. Read The Marriage of Figaro. What about this play do you think scared Louis XVI so much that he felt its performance could incite the public to overthrow the monarchy? 2. Beaumarchais often criticizes the aristocracy in his plays. Read Eugenie and The Barber of Seville, then answer these questions: What specifically does he criticize? Why? What do you make of these criticisms? Do they seem well-founded? In your response, use the Internet and the library to research the society in which Beaumarchais writes in order to evaluate his jabs at society. Also, make sure to cite specific examples from whichever text you choose to read. 3. Discuss the presence of useless precaution in The Barber of Seville. How does this theme appear and what role does it serve? 4. Research the French Enlightenment on the Internet and in the library. In what ways does the work of Beaumarchais exemplify the ideals of the French Enlightenment? Brereton, Geoffrey. French Comic Drama from the Sixteenth to the Eighteenth Century. London: Methuen, 1977. Hayes, Julie C. The Age of Theatre in France. Edmonton, Alberta: Academic Printing & Publishing, 1988. Frischauer, Paul. Beaumarchais. Port Washington, N. Y.: Kennikat Press, 1935.